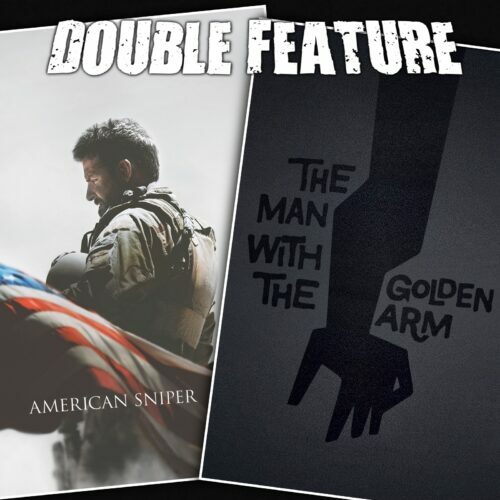 The ongoing war and peace series continues with American Sniper and The Man with the Golden Arm. Clint Eastwood brings the story of Chris Kyle in American Sniper. Navy S.E.A.L. sniper Chris Kyle’s pinpoint accuracy saves countless lives on the battlefield and turns him into a legend. Back home to his wife and kids after four tours of duty, however, Chris finds that it is the war he can’t leave behind. Michael lives in Texas and has feelings about American Sniper. Otto Preminger’s The Man with the Golden Arm talks about the impact of drugs in a time when that wasn’t talked about. A strung-out junkie deals with a demoralizing drug addiction while his crippled wife and card sharks pull him down. This entry was posted in All Podcasts, Year 9 and tagged Clint Eastwood, Otto Preminger. Bookmark the permalink.